Think back almost three years ago to 31 May 2010 and you might recall the Gaza flotilla raid. Although that name may not ring a bell, this incident occurred when an Israeli military force attacked a Turkish ship that was delivering humanitarian aid to the Gaza strip in Palestine. This attack shook the international political community and resulted in strained relations between Israel and Turkey that have lasted for the past three years. Turkey demanded a formal apology and Israel kept denying it on the grounds that they were merely defending their own waters and they were not at fault, although the attack took place in international waters. Recently, however, Israel has issued a formal apology for the deadly event and has agreed to compensate the families of the Turkish nationals, who lost their lives in the raid. This decision has resulted in a marked shift in the Middle-Eastern political sphere, and represents improved diplomatic relations. In addition (and possibly most importantly for Erdogan administration in Turkey), Israel's official apology raised Turkey's image in the region and in the Middle East to that of a 'super-power'. Read on to learn more about the Gaza flotilla raid and its implications. Since 1949, Turkey and Israel have been striving to formalize their longstanding positive diplomatic relations. They maintained a free-trade agreement, hosted each other's embassies, engaged in military cooperation treaties, established heritage preservation organizations for their cultures, and Turkey was a popular holiday destination for Israelis for many years. 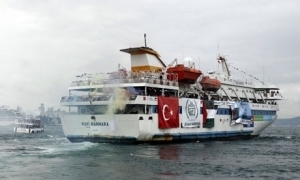 These positive relations came to a halt, however, on the last day of May in 2010, when Israeli militants boarded the Mavi Marmara, a Turkish boat that was attempting to deliver aid supplies to Palestine while Israel had a naval blockade in place. Israeli soldiers boarded the Turkish ship and immediately began shooting, which resulted in the deaths of eight Turkish nationals and one American. There were five other Turkish ships in the flotilla, and they were all towed to Israel where the occupants were first held captive and then extradited. This raid was denounced by the international community and resulted in negative attention for Israel, various global political demonstrations, and the decay of Turkey-Israel relations as Turkey decided to expel all Israeli ambassadors from the country. To add insult to injury (Turkish formal stance), Israel refused to acknowledge wrongdoing and denied an apology and reparations to Turkey. While this event cast Israel in a negative light, the country was thrown into further unrest as the Arab Spring intifada began only months later. Israel's raid likely contributed to the instability that was experienced in the region during this time, and it certainly did nothing for Israel in terms of casting the country in a flattering light. Instead, it provided a common enemy at which other nations could direct their outrage. Meanwhile, Turkey as the victim did not experience the violence typical of the Middle East during the Arab Spring. That period was favorable for Turkey, and provided a framework for Turkish real estate development and enhanced economic growth as a result of smart money pouring out of the Middle East and into Turkey. Turkey's refusal to accept Israel's actions also created an even more favorable opinion of the country amongst its neighbors, as Middle-Eastern leaders indicated that they had been yearning for the opportunity to stand up to Israel and were gratified that a country had finally dared to do what they had shied away from. Many nations had seen Israel's past actions as manipulative intimidation, and Turkish officials were lauded for their decision to keep demanding Israel's apology and acknowledgement of wrongdoing. The country earned respect from its neighbors for removing the Israeli ambassador from his Turkish post, and although this represented yet another failure in Turkey-Israel relations it improved Turkey's reputation held by its neighbors. Things continued to look up for Turkey, as its enhanced reputation allowed it to receive more international attention. Foreign nationals began purchasing homes there, as it represented a successful safe haven whose values were aligned with their own. The economy had been steadily improving and Turkey was gaining ground as strong economic force. But still, as Prime Minister Erdogan sought an apology from Israel, Prime Minister Netanyahu continually denied it. Only recently, at the end of March 2013, did Israel shift its stance on the issue, with a little help from U.S. President Obama, who campaigned for an apology and compensation. On 22 March 2013, President Obama visited Israel in an effort to maintain diplomatic ties, as the two countries, as the U.S. and Turkey are as well, have had a long-standing allegiance with one another. At the behest of President Obama, Prime Minister Netanyahu decided to apologize for the deaths caused by the Israeli marines in an effort to prevent the Israel-Turkey situation from deteriorating any further. Netanyahu also agreed to compensate the families who lost their loved ones during the raid. A phone call to Erdogan was made, and he accepted the apology and monetary offer from Netanyahu. The countries then agreed to reestablish their reciprocal ambassador arrangement. Although the status quo has not been returned to the level of diplomacy that was present pre-Gaza flotilla raid, things are looking up for Turkey and Israel as they can now begin to rebuild their relationship. This event further elevated Turkey's perseption in the Middle East as the regional super-power, a model state for the entire Middle East to aspire for. Israel's agreement to apologize and provide compensation suggests that Turkey is seen as a major force in the region, and that the country's request should not go unheeded because negative consequences may result. Turkey is coming onto the scene as a major global economic force, and Israel's decision to reverse its initial write-off shows that Turkey is demanding and receiving increasing respect from its neighbours, which is likely due to its growing diplomatic power. Despite the horrific events that transpired on 31 May 2010, Turkey has clearly come out on top of the game. The country is currently experiencing unbridled growth, attracting foreign investors, fostering trade and Turkish real estate transactions, and supporting a robust economic future. Turkey's success is on the trajectory to keep increasing, and the renewal of positive Israel-Turkey diplomacy could mean much for the countries. Although it is still quite early in the timeline of these developments, the international community can anticipate stability and diplomacy once again. Who knows exactly what cards to play and when? As Turkey's trade volume with oil-rich Northern Iraq keeps on increasing, as the Middle East starts looking at Turkey for all things new and for all horizons liberal, we can't help but ask 'who knows exactly what cards to play and when? '.